Introduction: E-cigarettes (EC) are devices that heat liquid into an aerosol that user inhales. Youth are using EC at increasing and alarming rates. The tobacco industry aggressively markets EC to youth, glamorizing EC use in advertisements, and offering EC in candy flavors such as bubble gum and gummy bears. The liquid usually in EC has nicotine and other additives which is addictive. Aim: The purpose of this study was to systematically review the role of e-cigarettes in smoking cessation. 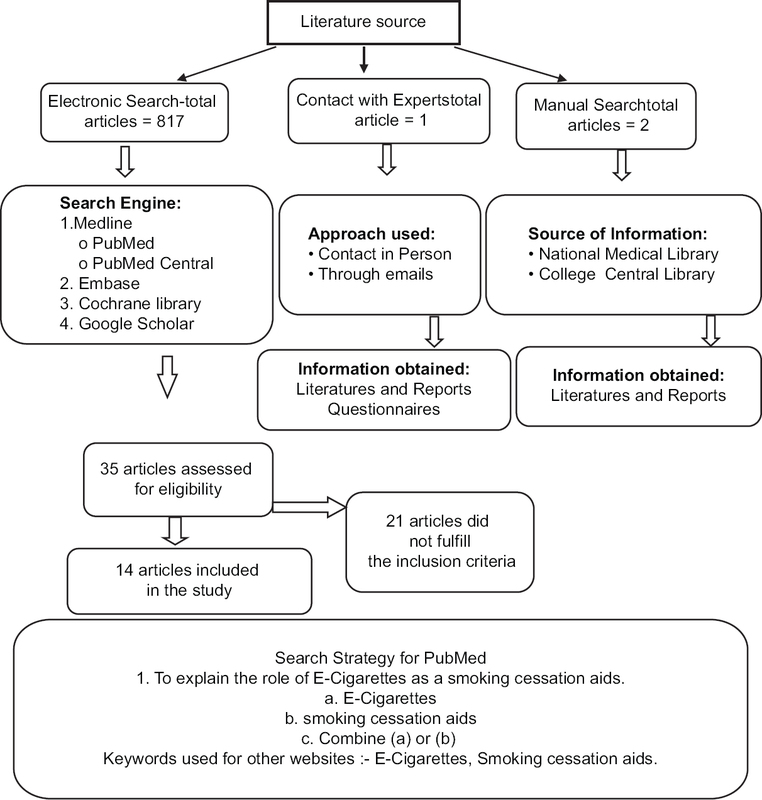 Materials and Methods: A literature review was performed; PubMed, PubMed Central and Cochrane Library, Embase, and Google Scholar were searched from 1970 to December 2017 to identify appropriate studies. Results: Out of the total 817 titles appeared, 17 articles fulfilled the criteria and were selected for the review. Two articles which were hand searched and one article which was through E-mail was also included in this review. EC have a direct impact on smokers and efficiency in quitting smoking was assessed very low. Majority of the study found that EC could increase the risk of smokers developing nicotine dependence and thus evidence on smoking reduction was found very low. Conclusions: There are relatively a few studies evaluating the role of EC in smoking cessation. EC products are marketed in a wide variety of channels that have broad reach among youth and young adults, including magazines, television, radio, and the Internet. More randomized controlled trials and longitudinal studies are needed to further clarify the role of EC in smoking cessation. Background: The escalating burden of noncommunicable ailments has imposed a major public health challenge. Smoking tobacco has claimed over 3 million lives worldwide and is the first and foremost source of morbidity among all age groups. Multimodal interventions ought to be infused in to revert the addicted individuals to better life. Aim: This study aimed to assess the effectiveness of three different tobacco termination interventions in patients attached to the outpatient unit of a health-care institute. 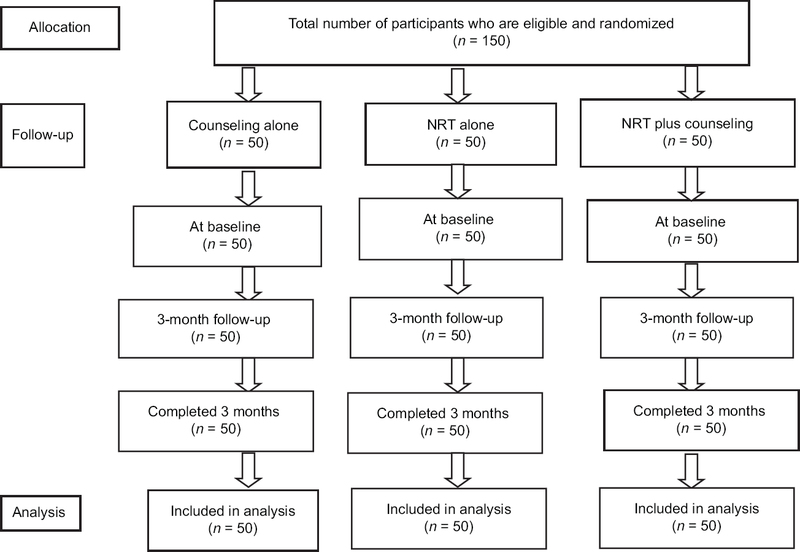 Materials and Methods: A tobacco cessation interventional study was performed on those patients who were randomly allocated to three different study groups composed of counseling group (Group I), nicotine replacement therapy group (Group II), and a combination of the both (Group III). For this, a carbon monoxide (CO) monitoring device, “Fagerstrom Test for Nicotine Dependence,” and specially prepared structured questionnaires were utilized. The interventions were planned and observations were assessed at baseline (preintervention) and at 12th week (postintervention). Intra- and inter-group comparisons were carried out statistically by means of one-way ANOVA test with post hoc pair-wise comparisons using Tukey's test. Results: The highest significant (P ≤ 0.05) mean nicotine addiction score variation of 2.44 from pre- to post-intervention was noted among Group III patients and intragroup comparison revealed a similar significant variance among Group III patients, i.e., 3.68 mean at baseline which reduced to 1.24 at follow-up. Inter- and intra-group assessments of mean score differences in the level of CO were noted to be highest among Group III patients. Conclusion: Even though the utilization of the pharmacologic methodologies available for smoking termination substantively mends the likelihood of realizing efficacious abstinence, the best upshots for cessation are accomplished when pharmacologic techniques are combined with behavioral means to treatment as the modus operandi of tobacco dependence counseling. Background: Reducing microbial load in the oral cavity will provide an additional rationale for the prevention of dental diseases. Antibacterial properties of topical fluorides and chlorhexidine (CHX) are well documented with certain limitations. However, effects of topical applications of 2% sodium fl uoride solution (NaF soln), 1% CHX gel, and 2.26% NaF varnish on plaque microfl ora and following its termination are less explored. Hence, there is a need to study the comparative effects on these agents in vivo. Aim: The aim was to assess quantitative and qualitative changes in the plaque microflora following topical application of 2% NaF soln, 1% CHX gel, and 2.26% NaF varnish. Materials and Methods: This was a double-blind, randomized, parallel-group clinical trial. A total of willing sixty schoolchildren of Nellore city with apparently good health aged 9–13 years were randomly allocated to three interventional groups as follows: Group A (NaF soln, 20), Group B (CHX gel, 20), and Group C (NaF varnish, 20). NaF soln and CHX gel were applied four times on a weekly interval and NaF varnish was applied only once. Once patients enrolled to participate in the clinical trial, an identification number was sequentially assigned, allowing maintenance of a double-blind, randomized study design. Plaque samples were collected at baseline (P0) and at seven different time intervals (P1: 1st week, P2: 2nd week, P3: 3rd week, P4: 4th week, P5: 8th week, P6: 12th week, and P7: 16th week) and cultured on nutrient agar medium. The number of microbial colony-forming units (CFUs) was calculated using a digital colony counter. Statistical significance within and between groups was calculated using Chi-square test, paired t-test, ANOVA, Dunnett's multiple comparison test, and Tukey's multiple comparison test. 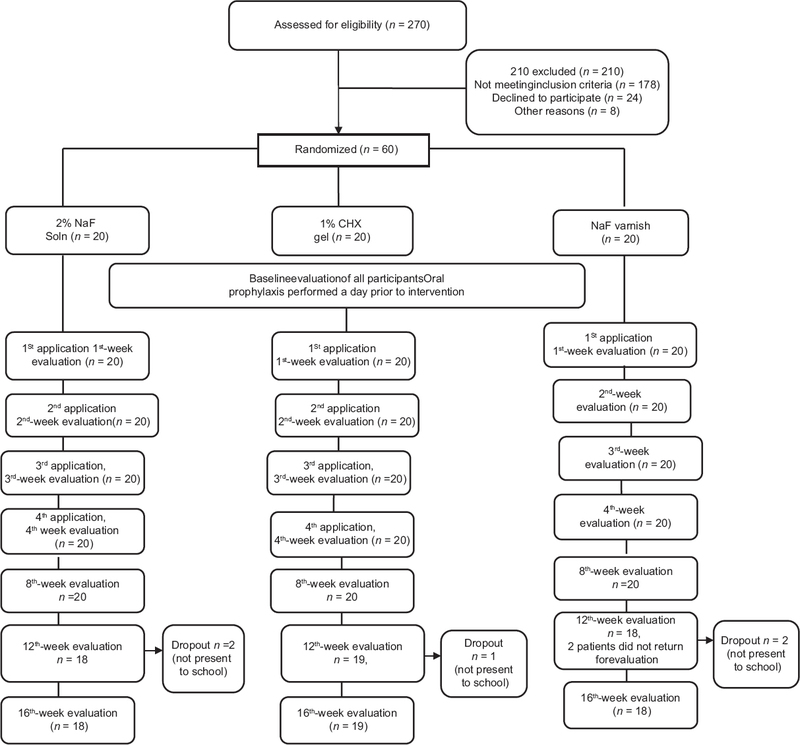 Results: There was reduction in the CFU in all the three groups at P2, P3, and P4 when compared to P0 (P < 0.05), but following termination of application, the CFU showed subsequent increase of CFU at P5 and P6, reaching similar to baseline values at P7 (P > 0.05). Single application of NaF varnish was equally potent as four times application of NaF soln and CHX gel, but there was no statistical significance in-between groups in terms of CFU reduction (P > 0.05). P7 sample estimation showed Lactobacilli species with 100% resistance followed by other organisms. Conclusion: All the three agents used demonstrated significant reduction of microbial load in plaque but allowed recolonization following termination of intervention. Background: Recently, public attention to the area of personal hygiene has increased for a variety of reasons and one of them is due to the growing awareness that a majority of microbes that cause diseases among humans gain access through various portals of entry and transmitted to these portals mainly through hands. Aim: The aim of this study is to assess the effectiveness of an integrated handwash and mouthrinse programme on the general health of young adolescent school children's in Puttur taluk. Material and Methods: A single-blinded randomized control trial was designed and conducted among school going young adolescents of Puttur taluk in Dakshina Kannada district of Karnataka. Two schools were randomly included as experimental and control group. Mouth rinsing was integrated to handwashing program for the experimental group. Mouth rinsing program was implemented and monitored for 7 months. Statistical Analysis: Descriptive statistics was performed and paired “t” test was used to compare the difference in means. Results: Mean age of the school children was 12.33 ± 1.3 years, gender ratio of male: female was 0.5:1 and 0.7:1 of case and control groups, respectively. Analysis of oral health and general health parameters of study group and control group at final evaluation revealed modified Oral Hygiene Index Scores significantly reduced in study group from 1.52 ± 0.6 to 1.07 ± 0.5 (P < 0.01), Gingival Index scores significantly reduced in study group from 1.12 ± 0.6 to 0.75 ± 0.5 (P < 0.01). Mean incidence of absentees among study group reduced from 5.16 ± 0.5 to 2.45 ± 0.5 (P < 0.001). Conclusions: Integrating a monitored mouth rinsing to existing handwashing program will not incur additional financial or logistic constraints but may have an effect in improving general health, personal hygiene, and oral health among school children. Introduction: The foremost goal of our education system is to develop the students' skills to reach information rather than transferring the present information. Instead of understanding and applying the concepts (meaningful learning), students used to memorize the facts. Therefore, long-term independent learning process is required for the students. Aim: This study aims to evaluate the effectiveness of mind mapping as a learning tool and to assess its information retrieval potential among dental students over conventional system of learning. Materials and Methods: An interventional study was conducted among 90 students of BDS 3rd year students. A questionnaire consisting of questions related to oral hygiene index (OHI) and OHI-simplified (OHI-S) was distributed to them. Data were analyzed using Statistical Package for Social Sciences (SPSS) 18.0 (SPSS Inc., Chicago, IL, USA) and descriptive and analytical tests including mean, standard deviation, and Chi-square test. Results: Of the 90 students, only 82 students responded to the questionnaire generating a response rate of 89.5%. The mean score of students in the mind map (MM) group was significantly higher than the conventional group (posttest – 13.60 ± 0.99 vs 8.73 ± 2.13, P = 0.001). Gain in knowledge score was 7.74 vs. 3.43; statistically significant difference was found between the two groups for the gain in knowledge score as well as in mean percentage gain in knowledge score. Conclusion: Specific and prudent thinking with self-efficacy should be the purpose of education system rather than making the students literate only. This requires shifting of traditional teaching method with innovative method, and MM is one of the innovative as well as attractive processes of teaching which further help the students to learn the subject more effectively in a creative way. Introduction: Anganwadi worker is the most periphery functionary of the Integrated Child Development Services scheme. They deliver services to children below the age of 6 years who form a very potential group that can be targeted for inculcating positive oral health values. Most of the anganwadi children are from rural communities who experience poverty, poor knowledge of parents, and underutilization of health services that result in poor oral as well as general health. Aim: To collect the baseline data on the dentition status of preschool children in anganwadi centers of Mangalore taluk. Methodology: The study population comprised of 530 preschool children in the age group of 3–6 years. After obtaining informed consent, dentition status was examined according to the WHO 1997 criteria. Statistical analysis was done using Statistical Package for the Social Sciences version 17. Mann–Whitney U-test was used to statistically analyze the data. The level of significance was set at P ≤ 0.05. Results: The dentition status among preschool children was poor with mean decayed, missing, filled teeth score of 2.74 ± 3.44. Gender-wise comparison did not show any statistically significant difference although girls showed a higher caries experience than boys. 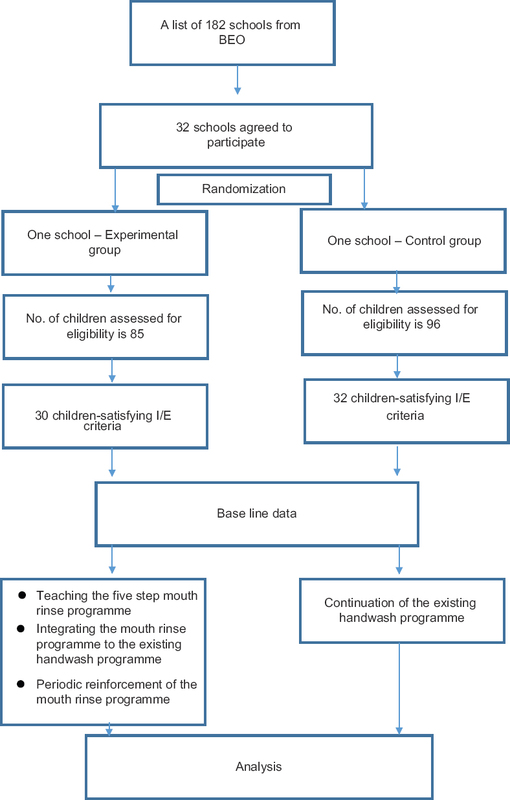 Conclusion: High caries experience in this study revealed that there is a great need to plan and conduct oral health promotion initiatives and treatment activities for preschool children from rural communities. Dental health services should be made available in the peripheral areas along with oral health education among parents and teachers to inculcate a positive attitude toward oral health among children. Introduction: Oral health is an essential component of overall health. Oral health maintenance is more complex for the physically challenged children; the essential problem is lack of cooperation and coordination because of their physical or mental inability. Thus, physically challenged children are considered as a high-risk group for having dental problems. Aim: The aim of this study is to assess dental caries experience, oral hygiene status, periodontal status, and prevalence of malocclusion among differently abled children attending special schools in Delhi. Materials and Methods: A total of 1060 (610 males and 450 females), differently abled children were included in the study. The children were grouped into visually impaired, hearing and speech impaired, and orthopedic physically challenged only. Clinical examination was recorded using Dentition Status and Treatment Need Index and periodontal status recommended by the World Health Organization (WHO), 2013 and examination for malocclusion was made according to the Dental Aesthetic Index as described by the WHO Oral Health Survey 1997. 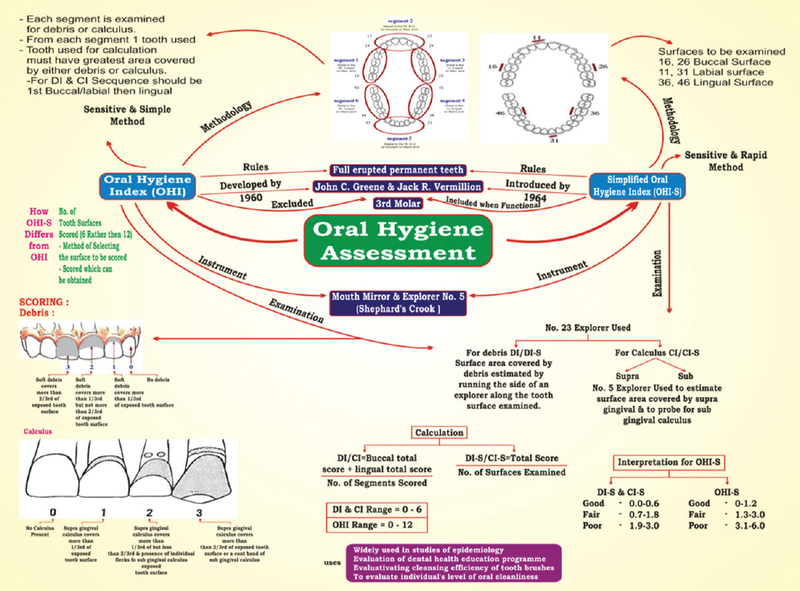 The Simplified Oral Hygiene Index introduced by John C Greene and Jack R Vermillion in 1964 was used to assess the oral hygiene status. Results: Out of 1060 physically challenged children, 56.4% (598) had dental caries with the mean index or decayed, missing, and filled teeth (DMFT) being 1.10 (standard deviation ±1.26). It was observed that prevalence of dental caries was high in visually impaired group (63.2%) and least in hearing and speech impaired group (51.7%). The overall oral hygiene status recorded was good in 58.5%, fair in 40.8%, and poor in 0.7% of the study population. Conclusion: The cumulative neglect of oral health was seen among the physically challenged children. Children with visual impairment had much more poorer oral health when compared to the hearing and speech impairment and orthopedically physically challenged group. An improved accessibility to dental services as well as dental health education is necessary to ensure that optimum dental care should reach this special group. Background and Objectives: Antibiotics are pharmacotherapeutic adjuncts prescribed by dentists for managing dental infections. Over the years, the overuse of antibiotics has been noticed which may lead to the development of resistance by certain species of bacteria. Hence, the study was conducted to assess knowledge and practice regarding antibiotic prescription and development of resistance among dental practitioners. Materials and Methods: A cross-sectional study was conducted among 400 dental practitioners in Bengaluru city, India. Data were collected using a structured pro forma regarding demographic details and knowledge and practices about antibiotic prescription and development of resistance. Descriptive statistics were calculated. Chi-square test and binary logistic regression analysis were performed. P < 0.05 was considered as statistically significant. Results: A majority of participants were postgraduates (59.5%). UG/PG training (95.0%) and scientific materials (91.7%) were the major sources of knowledge. A high percentage of the study participants were prescribing antibiotics for conditions such as tooth fracture (56.7%), dental caries (53%), and simple extraction (54.5%). Dental practitioners with postgraduate qualification believed that self-prescription by patient (odds ratio [OR] = 1.06, [P = 0.80]) and overprescription by dentist (OR = 1.10, [P = 0.62]) may lead to the development of antibiotic resistance. Conclusion: Knowledge related to antibiotic prescription was low. Although the majority of participants were aware of the antibiotic resistance, still indiscriminate prescription of antibiotics was found indicating a need for updating regarding appropriate antibiotic use through Continuing Dental Education programs. Background: Periodontal diseases are considered to be the most prevalent chronic infectious disease of the gums. 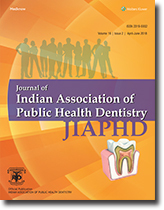 Aim: The present study was conducted to assess the awareness and practices on oral hygiene and its association with the sociodemographic factors among patients attending the general Outpatient Department (OPD) of the Faculty of Dental Sciences, BHU, Varanasi, India. Material and Methods: A cross-sectional study was conducted among 526 patients attending the general OPD of the Faculty of Dental Sciences, BHU, Varanasi, India, from September 2017 to November 2017. The study tool was a predesigned and pretested semi-structured schedule. Data entry was done in Microsoft Excel sheets and analyzed using SPSS 16 (SPSS Inc. Released 2007, SPSS for Windows Version 16.0., SPSS Inc., Chicago, IL, USA). Descriptive statistics and Chi-square analysis were used. Results: About 87.1% of the participants used a toothbrush with toothpaste as a method of cleaning their teeth; 21.7% brushed their teeth twice daily; and very few were using floss or other interdental cleaning aids. About 52.5% of the people visited the dentist due to pain and only 21.7% visited for checkup in the past 1–5 years. Most of the people admitted to the fact that oral health affects general health. Conclusion: Oral health awareness and practices among the study population were poor and need improvement. Background: Oral health is a functional unit of general health. Dental caries and periodontal diseases are considered as the major diseases prevailing in the modern era. Over decades, the perception toward maintaining oral health and interest for preventive oral health measures has decreased, thus increasing the healthcare expenditure. Aim: This study aims to estimate the household expenditure on oral health care among people residing in Durg, Chhattisgarh, India. Materials and Methods: Eight hundred and sixty participants were surveyed who were residents of Durg, Chhattisgarh (C.G.). Participants were selected through multistage cluster random sampling. A self-designed pretested and validated 20 item questionnaire was used to assess the expenditure on oral health care. Data collected were analyzed using IBM SPSS software version 23 for Windows (New York, USA). Frequency, mean and percentage, and Pearson's correlation coefficient tests were used to analyze the data. Results: Out of 860 individuals, 204 (23.7%) were males and 656 (76.3%) were females. Eight hundred and thirty-two (96.7%) individuals reported using a toothbrush as an oral hygiene aid. Majority (58.3%) of the families reported changing toothbrush at 3 months or more duration, while 37.8% of the families in 1 month or less. A statistically significant weak correlation was observed when education, occupation, and income were compared with annual expenditure on dental care (r = 0.219, 0.239, and 0.350, respectively). While a moderately strong correlation was observed between the socioeconomic status of families and annual expenditure on dental care (r = 0.438). Conclusion: People should be aware of preventive oral hygiene aids, and appropriate policies should be formulated which will ultimately result in decreased expenditure on a curative aspect of the dental disease. Background: Reverse osmosis (RO) technology is an efficient method of reducing organic and inorganic contaminants of drinking water. It regulates the fluoride concentration in drinking water which influences the burden of dental caries and dental fluorosis in the general population. This study was designed with an aim to assess the effect of different RO water filters on fluoride content of drinking water. Materials and Methods: Ten different RO water filters available in the local market of Dhule city, Maharashtra, India, were tested in this study. Samples of filtered and nonfiltered tap water were collected from these RO filters installed in ten different households in the same area in Dhule city on three successive days, and fluoride analysis was done using fluoride ion selective electrode. Results: The amount of fluoride removed by different RO purification systems varied from 0.270 to 0.457 ppm (50.37%–84.62%). RO filters with total dissolved solid (TDS) controller showed more fluoride removal capacity (mean, 0.41 ppm) as compared to filters without TDS controller (mean, 0.36 ppm) (P > 0.05). Conclusion: RO is an effective defluoridation method. However, considering the beneficial effect of fluorides in reducing dental caries, when drinking water is subjected to water purification systems that reduce fluoride significantly below the optimal level, fluoride supplementation may be necessary. Introduction: Epilepsy affects seventy million people worldwide. India accounts for 10%–20% (5–10 million) of the global burden of epilepsy. The prevalence of dental caries is significantly higher in epileptic children. Antiepileptic pediatric liquid medicaments (PLMs) are commonly prescribed and are easily accepted by children. However, these drugs can place children at risk for dental caries and dental erosion, when used on a regular basis and over a long period. Aim: The aim of this study was to analyze the cariogenic and erosive potential of pediatric anti-epileptic LMs. 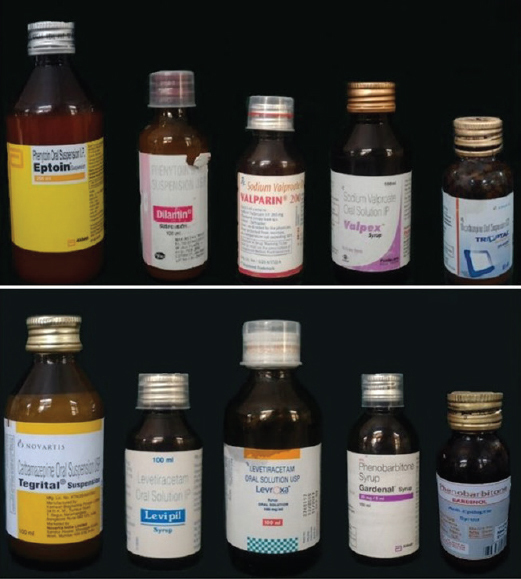 Material and Methods: Ten pediatric antiepileptic LMs which are most commonly used in children for a prolonged period were obtained from local pharmacies after consulting pediatricians of Bengaluru city. Physicochemical analysis for endogenous pH, viscosity, and sugar content of these antiepileptic PLMs was done. 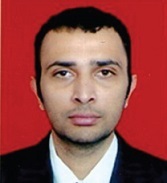 Data obtained were subjected to statistical analysis using SPSS software. One-way ANOVA, post hoc test, and t-test were used for the statistical analysis. Results: Most of the antiepileptic PLMs analyzed showed low pH, high viscosity, and higher total sugar content. Statistically significant differences (P = 0.001) were found among the PLMs in terms of pH, viscosity, and sugar content. Conclusions: Most of the antiepileptic PLMs showed cariogenic and erosive potential. Thus, the study highlights the need to reformulate the antiepileptic PLMs with sugar substitutes or making it sugar free.